Testing the Amazing, Multi-Purpose Powers of Witch Hazel | Finding delight. Lately, I’ve been having a love affair with Witch Hazel. It just feels so nice as a toner on a freshly cleaned face. I had tried it before but never really worked it into my daily routine. But now I’m feeling like a true convert. Have you ever used Witch Hazel as a toner? Facial Cleansing – Cleans skin pores and dries up excessive oil without totally drying out the skin. The ability to dry out blemish areas while still moisturizing sounds like a dream come true for my combination skin. 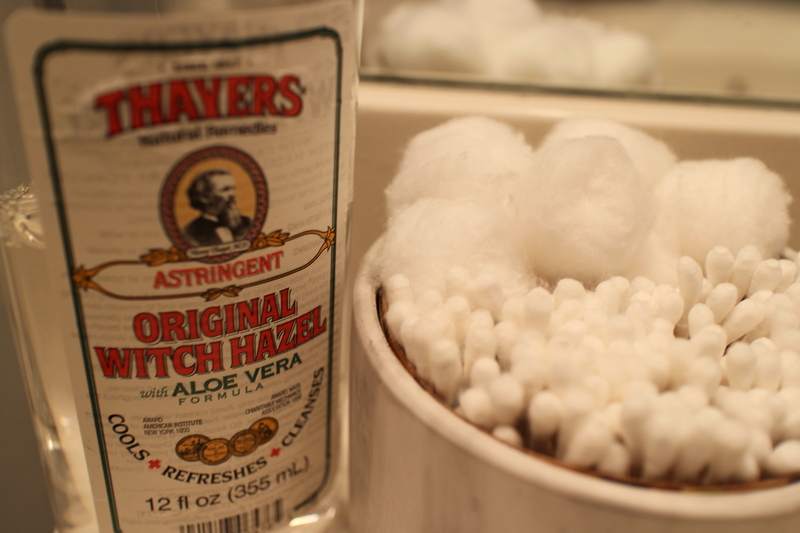 Acne Treatment – Similar to how I use Witch Hazel as a toner, apply to problem areas with a cotton ball. How does it help? Witch Hazel has strong astringent and antioxidant properties because of a high tannin content. Under-eye Bag Relief – You know the ol’ beauty hack of hemorrhoid cream to tighten up the bagginess below your eyes? Know what’s an ingredient in stuff like Preparation H? Yep, Witch Hazel. Heal Bruises Faster – This one I gotta try since my legs are pretty much perpetually banged up. Treat Cuts or Scrapes – Witch Hazel can be used as a substitute for rubbing alcohol or hydrogen peroxide when cleaning a wound. Soothe Sunburn – Thanks to anti-inflammatory properties, applying a washcloth soaked in Witch Hazel to a sunburn is a great way to lessen healing time. Plus, it can reduce peel-y, flaky skin down the road. Natural Deodorant – I’ve noticed Witch Hazel as a main ingredient in some of my favorite store-bought natural brands of deodorant but it never occurred to me to use it to make my own. Relieve Itchy Bug Bites – Again, Witch Hazel’s anti-inflammatory properties come to the rescue! Just apply a soaked cotton ball to the bite. Household Cleaner – I found a ton of recipes that incorporate Witch Hazel into cleaning solutions. Seems it’s great for bathrooms, chrome fixtures, mirrors, and even mopping floors! Jewelry Cleaner – And on it’s own, it can be used to gently clean jewelry. Alright peeps…which of the ten are you itching to try? P.S. Baking soda is similarly amazing with a million uses. Here’s how to use it as a face mask! I had no idea that you could Witch Hazel for so many things. I’ve used it as an astringent before — but there is something about the smell – most people don’t mind it, but my nose must be sensitive because it just turns me the wrong way! LOL! Awesome write up! In Latino culture (I’m Puerto Rican) it’s the cure all but all these other uses, wow. Lol, they were onto something.